For many cities around the world, this weekend is Gay Pride time! And if you're getting tired of celebrating LGBT life in the same place every year, I have just the ticket — or seven of them, in fact. Pride's celebrated all around the world in different ways, but some cities manage to do it on a grand scale, with thousands of participants, giant floats, huge after-parties and metric tons of glitter. (I am not exaggerating. Just wait and see.) If you're keen to get international in your rainbow love, these are the seven places to make sure you see. In the wake of the Orlando massacre, you will find that 2016 and 2017's Pride events will have higher security and more intense police presences (and quite possibly a more defiant spirit), but that's no reason to not attend. If anything, the climate of mourning and fear in the LGBT community worldwide is the biggest motivation to get out your tutu, smear on some face paint and go dance with thousands of other people who love LGBT life, whether they're LGBT themselves or supporters (One of the most fundamental aspects of Pride parades is that they're both LGBT and straight-friendly, though participation itself is usually restricted to LGBT people and their allies and family). As a queer person who'll be dousing herself in glitter and waving a flag around London on June 25, I hereby invite you to come join me at one of the seven best cities in the world when it comes to Pride. The NYC Pride festival does it bigger, better, louder. Since the first march for gay pride and visibility was held there in 1970, the event has expanded hugely, and now involves many events all joined into one, from the legendary parade on June 26 (last year's involved 350 floats, and this year's will likely have more, according to the New York Daily News) to the dance on Pier 26, which will involve Fergie and a fireworks display this year. You know, just a regular evening out. This year's guest judges for the parade floats, marching bands and dancing troupes during the parade include the young trans activist Jazz Jennings. Get all the details on the 2016 event here. Pride completely takes over the famous landmarks of London every year, from Oxford Street to Trafalgar Square. This year's massive celebration centers around June 26, when a parade with a mere 40,000 attendees (yep, you read that right) will march, dance and holler through a giant parade route that ends in Soho, essentially the gay capital of the UK. For Londoners, though, the Pride parade is only the end of a month of celebrations for basically everybody: other events in the Pride calendar this year include performances by the London Gay Symphony Orchestra, queer film screenings and (obviously) gigantic, ridiculous after parties. Get all the details on the 2016 event here. Sydney's Mardi Gras isn't the typical Pride parade: it's held in March as opposed to during World Pride Week. But for Australians, it's the equivalent of Pride, on a spectacular scale. It's been going since 1978, making it one of the oldest worldwide, and is now usually attended by thousands: the 2016 Mardi Gras parade peaked at around 30,000 people, which is pretty whopping for a country with a population of only 23 million. This year's festivities featured Conchita Wurst, floats from all of Australia's police forces, and the Aussie performer iOTA, who you'll probably know as the dude with the flaming guitar from Mad Max: Fury Road. And it was (conservatively) estimated that 460kg of glitter were used on the parade floats and costumes. That's nearly half a ton. Get the details on the 2017 event here. If New York has one challenger for the crown of "biggest, splashiest U.S. Pride festivities", it's San Francisco. As is only proper. The very first parade involved a "gay-in" at Golden Gate Park, and from those humble beginnings, it's become one of the biggest Pride festivals in the country. This year, Peaches will be headlining the Main Stage at San Francisco City Hall, and the theme is "For Racial And Economic Equality." One of the event marshals for the parade itself on June 25 is the organization Black Lives Matter. If you want your Pride political as well as extravagant, this is the event for you. Get all the details on the 2016 event here. If you're hoping to make it to Sao Paolo's Gay Pride festival this year, you're too late: it's held in May. But fear not: two million other people got to experience it instead. No, that is not a typo. The Sao Paolo event is the world's biggest by a considerable margin, because Brazilians do not mess around when it comes to partying. (The Sao Paolo Pride organizers slyly point out that Pope Benedict's visit to Brazil in 2011 only attracted one million.) The march itself isn't as dominated by floats as some others: there were only 25 official ones in 2016. Instead, it's all about street theater, dancing, Carnival-style extravagance and copious amounts of music, and the 2016 event focused on transgender rights. First off, in Berlin the annual gay pride celebration isn't under the Pride umbrella: it's called Christopher Street Day, and is held as a commemoration of the Stonewall riots in New York's Christopher Street in 1969. This year's event is slightly different from the others in its timing: due to the European football championships, it's been delayed for a month, and will happen in July. It's also a very political event, with a demonstration rather than a parade, involving a lot of protest groups, activists and rallies at the Brandenburg Gate. The theme for the 2016 event? "Danke Fur Nix," or "Thanks For Nothing." There will also be a particular focus on LGBT refugees. Get all the details on the 2016 event here. Amsterdam Pride is not for those afraid of water. One of its most famous parts involves the Canal Parade, in which floats and boats are decked out in their best LGBT gear and sail from one end of the city to the other on the famous canals. (Only 80 boats can participate, but it attracts thousands of spectators in a giant crush.) 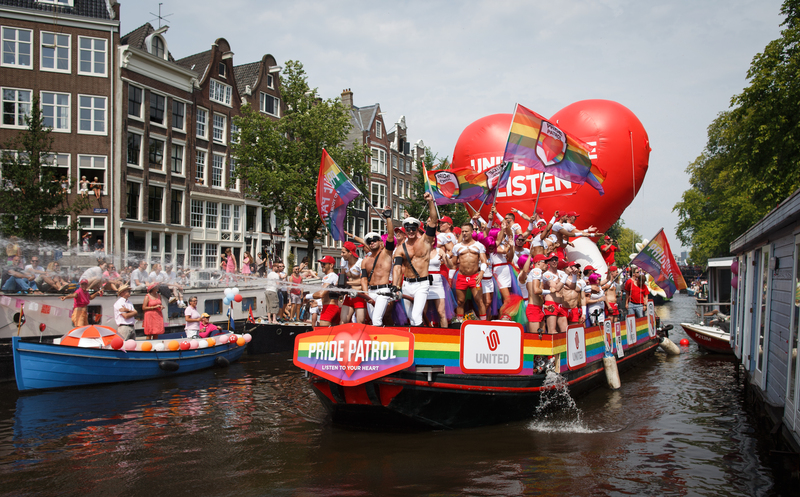 Alongside this water-based "parade," in 2016 Amsterdam is the host of EuroPride, a traveling European Pride festival, who will host Pink Saturday on July 23, a mishmash of political events, pride walks, music and art. Plus there's the Drag Queen Olympics. How can you possibly miss out? Get all the details on the 2016 event here.